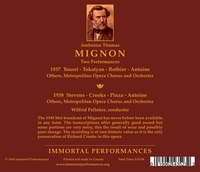 "At her Metropolitan debut, Tourel was already a magnificent artist....In the opening scene, Tourel immediately establishes the changeability of Mignon's character....'Connais-tu le pays' overflows with delicious portamenti and beautifully arched phrases....In her duet with Lothario she fairly prances and, unlike other Met Mignons, she even includes a little cadenza, hinting at her future Rossini specialty. Despite the excellence of her first act, one is unprepared for the searing heat of Tourel's portrayal in the second scene of act two. Tourel takes all the high options, including several high B-flats and a high C, singing with passion yet with perfect vocal and musical control. The audience bursts into applause at the abandon of her cry 'Dieu! je deviens folle de rage et de douleur!' Neither Swarthout nor Stevens...comes near to matching the eloquence of Tourel in this scene...."
"Miss Tourel is mistress of a wider range of coloration in all ranges and at all volumes than any other singer I have ever heard....Her legato skips are the kind of bel canto one dreams about....Her musicianship in every domain is so thorough that from the whole technical and intellectual aspect her work belongs clearly with that of the great virtuosos of music....Miss Tourel is, I believe, unequaled among living singers for the high concentration in one artist of vocal skill, sound musicianship, and stylistic flexibility." 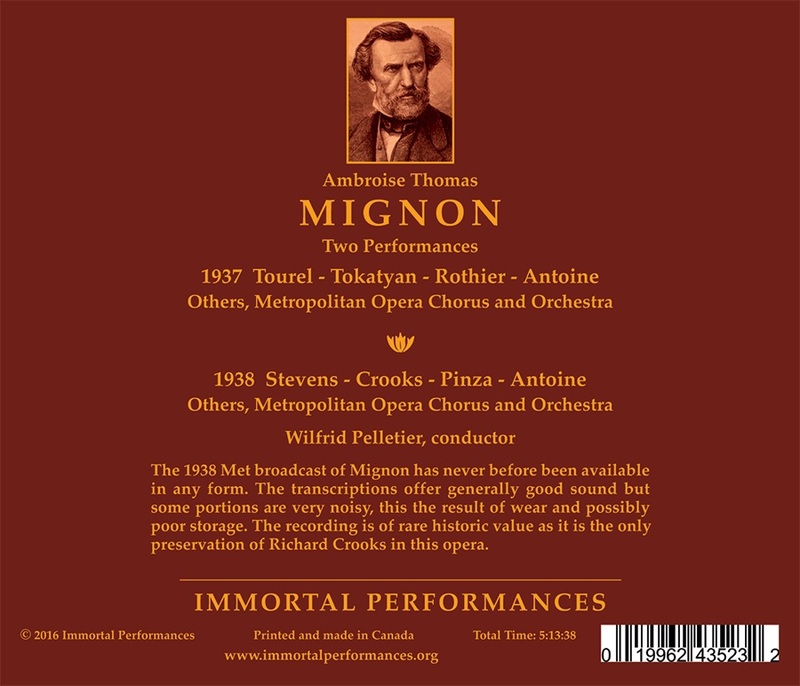 "Ms. Stevens [made] her formal operatic d�but in Prague, as Mignon, in 1936. Joining the Met in 1938, she made her first appearance with the company on 22 Nov., singing Octavian out of town in Philadelphia. 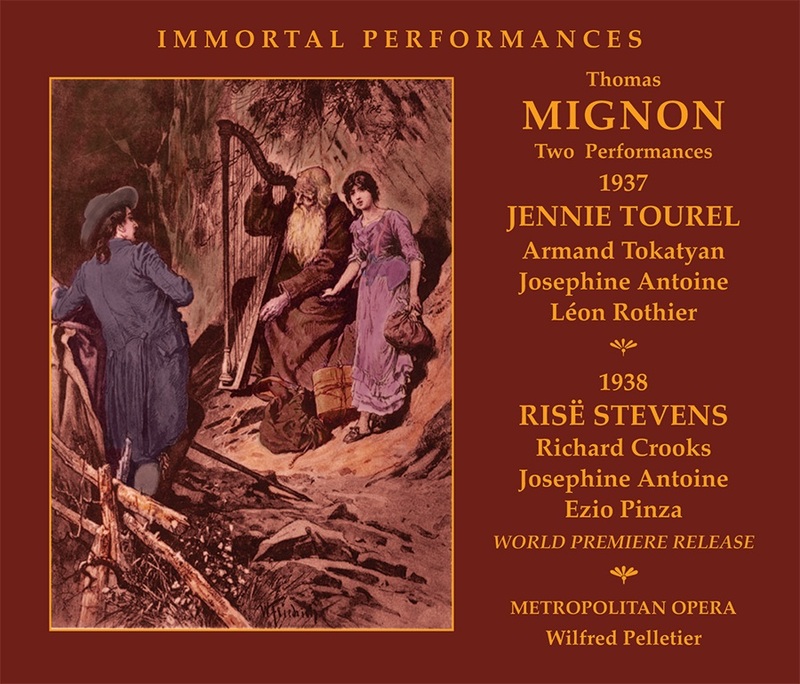 On 17 Dec. [above], she performed for the first time on the Metropolitan Opera stage in New York, singing Mignon." "...Crooks'...voice was by far the most attractive among the American tenors of his generation, combining the sweet Irish lilt of a John McCormack with the weightier accents of a German lyric....he was a favorite with Toscanini, Walter, and Mengelberg - under the latter's baton, Crooks participated in the American premi�re of Mahler's DAS LIED VON DER ERDE."